Greetings Internet travelers, Jerm here with yet another interactive update about a very exciting new feature that we just added to our arsenal of website improvements! I guess I kind of gave it away with the title and all, but in case I didn&apos;t...WE ARE MOBILE! Not the office, but I was referring to the Tampa Bay & Company website. This past Friday we launched the mobile version of our website, so that we can give access to all of our visitors. As great as our regular website is, there are a lot of bells and whistles on there that limit the amount of information that our mobile users can have access to all at once. We know you just want to get the information you need when your on the go, so we simplified the interface and shrank it into a neat little mobile website that gives access to things to do in Tampa Bay, Tampa Bay nightlife, Tampa Bay shopping, and much more! If you are on your mobile phone, just do what you would normally do and go to www.VisitTampaBay.com. 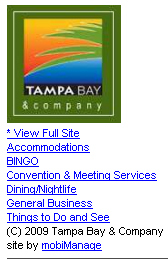 You can also access the site at Mobile.VisitTampaBay.com From there, the site should re-direct you to the mobile version and there you have it at your fingertips access to listings, phone numbers, and descriptions galore so you can plan your next trip, or if you are already here, navigate around the area! So take it for a test drive and let me know how you like or if you want to see some changes to it , as I am all ears!